Walmart on Monday said that it was getting into the wireless service business. Walmart will be providing its own mobile plans which it runs on the T-Mobile’s network and is said to start exclusively in Walmart stores starting September 20 this year. The company says the new plan is to “help families stay connected while saving money”. Walmart’s Family Mobile service plans “unlimited talk and text” plans for only $45 per month which less that what T-Mobile offers. No contract is required for the plan. This unlimited plan is atleast $15 cheaper than T-Mobile’s contract-free unlimited talk and text plans while a similart AT&T plan costs $70 per month with a two year contract. Verizon offers a similar plan for $90 a month. However there is a dark side to Walmart’s mobile service. The data plans are very expensive. A 1 GB prepaid data plan costs $40 while AT&T’s 2GB data plan costs $25 per month. T-Mobile’s unlimited data plan costs $30 per month. With high data rates it is clear that Walmart wants to target lower- to middle income families who are always hunting for a more affordable phone. 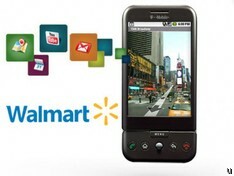 Walmart also announced that it plans to offer Android phones apart from other touch screen devices. Next Cell Phones Powered by Your Voice!